Lemon is one of my favorite flavors, along with lime and I am always looking for new ways to incorporate those flavors into desserts. From cakes to mousses to fruit bars and pies, I love them all if they include lemon! 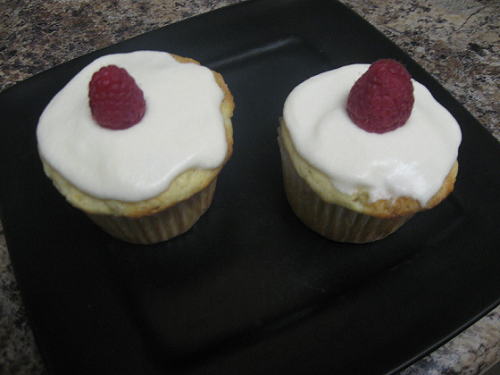 One of my favorite food bloggers: Mel's Kitchen Cafe posted a recipe for lemon cupcakes that sounded amazing and since I don't often make cake completely from scratch and I needed a dessert to take to my in-law's tonight I thought it was the perfect fit. The cupcakes turned out beautifully, spongy and a little dense (the way I like cake) but the frosting is my favorite part! That lemon frosting is sooooooo yummy I had to resist gobbling it up with a spoon and leaving the cupcakes naked. What are your favorite dessert flavors?